Intersection-related accidents are a common type of traffic incident, in fact they account for almost half of all traffic collisions across the United States. Did you know that according to a recent study by the National Highway Traffic Safety Administration (NHTSA), more than 40,000 people have been killed in traffic intersection accidents and almost 3 million more were injured? Unfortunately, many of these accidents could have been prevented as most occur due to negligent drivers simply not paying attention while they are behind the wheel. Have you been you hurt in an accident that occurred at an intersection? A traffic intersection accident lawyer from Harbin & Burnett can help fight for the justice and compensation you deserve. For free legal advice today and help with your claim, fill out the free case evaluation form on the right side of this page or call us at 1 (888)821-0247. Advocates for Highway and Auto Safety, an alliance organization aimed at making the nations roads safer, compiled facts about accidents that occur at intersections. These crashes pose a huge safety risk to drivers and pedestrians because of changes in traffic flow and direction among other factors. In 2003, 2.9 million intersection-related accidents killed approximately 1,000 people and injuring another 181,000. 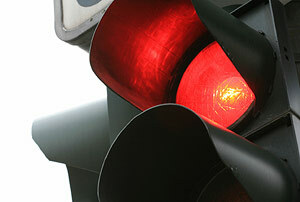 Of those accidents, 219,000 crashes happened because a car was running a red light. Pedestrian fatalities and injuries are higher at intersections: 58% of all injuries and 21% of all fatalities occur because of a collision with a motor vehicle in an intersection. A Louis Harris poll conducted by the Advocates for Highway and Auto Safety reflect that 78% of respondents believe extra attention should be paid while passing through an intersection because of the presence of increased risk. Almost 50% of all crashes in urban areas take place at an intersection. A survey conducted by the U.S. Department of Transportation shows that one in every three Americans knows someone who was hurt or killed because of a red-light runner. Intersections with roundabouts produce far fewer accidents than those with signals or signs. A study conducted in main on 24 intersections before and after roundabouts were added showed fatalities decrease by 90%, while injuries fell by 76% and crashes were reduced by 39%. After an accident, if you are able try to move your vehicles out of the intersection to avoid further danger. Contact emergency medical care if necessary and always remain at the scene and report the incident to police. Consulting an attorney can help you determine whether you have an injury claim if you believe your crash was the result of another persons recklessness. The attorneys at Harbin & Burnett are prepared to take on your claim. We believe the victims of traffic intersection accidents deserve to be represented aggressively and with confidence in their legal team. Contact our firm today for a free evaluation of your case by filling out the form on the right or by calling our office at 1 (888)821-0247. At Harbin & Burnett, we only get paid when we win* and are ready to help you today.